2. Line 12 hole muffin tray with patty cases. 3. Place eggwhites, sweetener, almond meal, rind butter in a large bowl and whisk until just combined. do not over mix or it will toughen. 4. 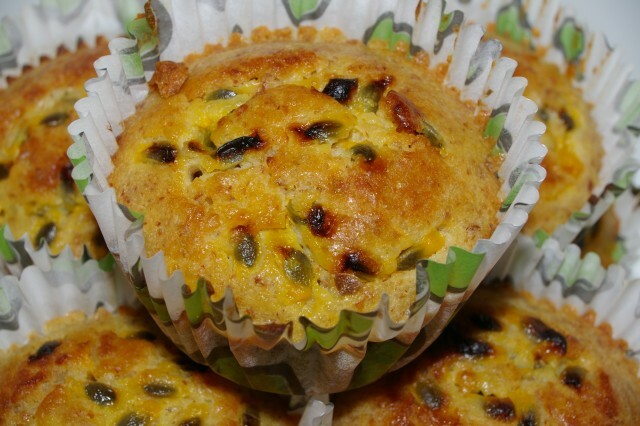 Spoon evenly across patty cases then uses a teaspoon top each patty evenly with the passionfruit pulp. Using the back of the teaspoon swirl the pulp into the batter for a marbe effect. 5. Bake for 20 mins or until a knife inserted into one comes out clean, stand for one minute then turn onto a wire rack and cool completely. The post was edited 1 time, last by Sherrie: Update sweetener ( Nov 10th 2018, 7:27am ). Wonder how this one would work with coconut or macadamia oil? A lot of cake recipes use vegetable oils so I reckon it would work. Thanks Sherrie, Looks wonderful. Will have to give it a try this weekend. can you please tell me if you make these in "muffin" pans or "patty" pans? i.e. what size are they? Look yumm!!! Just a standard muffin tray and muffin cases I would think, I looked at the muffin cases that I used for that recipe and it just said something like 100 muffin cases. Urghh I need to update the sweetener!